The third commandment in the book of Exodus is, ‘Thou shalt not take the name of the Lord thy God in vain’. I was brought up with Church and Sunday School and we were taught that this meant that you shouldn’t use the name of God as an exclamation or, when we got older, worse still to swear. But in ancient Judaism, where the commandments originated, it went much further than that. The name of their God, ‘Jaweh’, could not even be spoken. God did not live in the words of man as an abstract concept, but was the very life of man. ‘Jaweh’ is the sounds of the breath. ‘Ja’ (pronounced ‘ya’) the in breath and ‘weh’ (pronounced ‘whey’ or ‘way’) the out breath; try it and you’ll see what I mean. So God lives in the breath. In Ancient Greece the word for breath is ‘pneuma’ and the same word was also used to mean ‘spirit’. In the past breathing was obviously highly venerated, but it’s easy, in our time, to take breathing for granted. It happens naturally. In certain activities, singing, the playing of wind instruments, sports, yoga, the breath is focused upon and utilized, but most of the time we give it little thought and yet if you try to hold your breath you realize what a powerful force is behind it. It is impossible to stop breathing. With practice you can hold your breath for a long time, but eventually you are forced to breath. The human will is not strong enough to overcome the spirit of breathing. Jesus was wrapped in ‘swaddling clothes’, but today this is a lost art. People like to encourage their babies to use their limbs whereas with swaddling (wrapping the body of a baby up with a length of cloth) the limbs are bound to the body preventing their use. This is because primary development does not happen through conscious effort, but through the unconscious rhythm of the breath. By wrapping a baby, the movements of the breath are reflected, by the tension in the cloth wrapping, back into the body, so making full use of the breath to work the structure and develop core strength in the trunk. Not only does breathing play a huge part in the development of a strong body in babies, it also , in the same manner, contributes to the maintenance of our bodies throughout life. We think of exercise as physical activity, but our breath is constantly exercising the core of our bodies while we rest. However, when a body is as badly damaged as mine was, the core structure is so depleted that breathing not only fails to contribute to the maintenance of health, it can actually become a negative influence. To understand this we need to understand the nature of how we breathe. For quite some years now I have spent time focusing on my breath, feeling for the rhythmical expansion and contractions and seeing how it has changed over the years. To start with this was very difficult, due in part to the fact that the rhythm wasn’t working properly in my depleted core structure, but even now that we are getting closer to finalising the rebuilding of my trunk and the natural rhythm has returned, it is still difficult to appreciate. As soon as we focus on our breathing we bring conciousness into breathing which overrides that natural unconscious rhythm making it impossible to truly observe in ourselves. However, if we breathe gently it is possible to gain an understanding, through observation, of the rhythmical expansion and contraction of all five chambers of the trunk. Breathing is a process whereby air is drawn into the lungs by the expansion of the chest, but we must not see it as an act of the chest alone. The entire trunk plays its part in breathing. The trunk is made up of three convex sections to which limbs are attached, the head, the chest and the pelvis, and yes our head does have a pair of limbs; they are the two halves of our jaw fused together at the front. These three sections are connected by the two concave sections, the neck and the abdomen. The convex forms expand and contract in a vertical direction, while the concave expand and contract in a horizontal direction, in a radial manner (please see fig. A). The abdomen, and even the pelvis, play a considerable role in assisting the expansion of the chest and although the head and the neck play less of a role in this respect, their expansion opens up the airways allowing for the inflow of air. As fascinating as the manner in which air is inhaled and exhaled is, what I find even more fascinating is manner in which this unconscious rhythm maintains the capacity in our bodies. The rhythmical pulsation of the structure constantly works the internal tissues to maintain their strength and form. The trunk with its five sections is essentially a pneumatic structure; not that it contains air as the lungs do when inflated, but that it has a volume, a density and a pressure as a container of air with an elastic membrane would, ie. a balloon. If the living nature is allowed to decline then the density and pressure will decrease and, in conformity with Boyle’s Law, the volume will increase. If there is further decline then the volume will also decrease. This can be seen by simply observing those around you. We all live less than perfect lives and many end up with expanded bellies. In those that are very weak we can see there is no volume to them. With an injury as drastic as breaking your back, the quality just drops away. With the trauma of the accident there is a shutting down and then because of the seriousness of the injury and the following weeks of bed rest (ten in my case) the body doesn’t get to start up again. This results in a terrible depletion of the trunk. The inner capacity is lost. 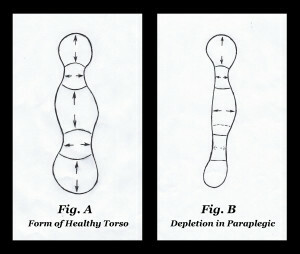 You end up with a body that has no volume to it let alone density and pressure and this is both above as well as below the level of paralysis. My chest had no more depth than the width of my arm and my abdomen had so little quality that you could feel my spine through my belly. The pelvis had collapsed to have virtually no inner volume at all. Even the head and the neck do not escape this depletion. With the head being a bony structure it is not so obvious, but the occipital region in particular, at the posterior base of the skull, was collapsed in. The quality of the internal organs was so low that it is amazing that metabolism, digestion and even breathing could continue to function. More importantly, without that the capacity to the trunk you have no foundation of strength and this is the primary essence of paraplegia and the real barrier to recovery. The quality has fallen to the point that breathing is disrupted and can no longer work to maintain, let alone build, capacity. Rather than operating in a vertical manner, the chest expanded and contracted in a horizontal fashion and the bottom third of the chest belonged to the abdomen, as shown by the dotted line in fig. B. Although the internal diaphragm existed to separate the chest and abdomen, in the bio-mechanical working of the cavities the division had shifted. Breathing did not work down into the pelvis whatsoever. Not only was the pelvis getting no inputs from breathing, with the chest working in the wrong direction breathing had become counter productive to the maintenance of internal capacity. The quality of my body had fallen beyond the point of no return, in any natural manner, so in order for it to recover we have had to deliver mechanical inputs by hand to rebuild that primary structure. This we have been doing over many years now and slowly but surely the power of the breath has returned. For some time now the division between the chest and the abdomen has been back to the diaphragm, where it belongs, and finally breathing is working down into the pelvis in a manner that is truly working that structure to increase its volume. Breathing is a long way from taking over from the need for ABR therapy, but with sixteen breaths per minute that is 23,000 inputs per day or 8 million a year, It is now a huge contributor. The great driver is back!